Have you been thinking you'd like to write your life stories, but feel stumped about where to begin? Maybe you've started, have notes in shoe boxes all over the house, but need help organizing them? Has the family been bugging you to just do it already? For them? For the world? Or, perhaps you are a published author new to the memoir form? Or is this you--it's not your time, but you have parents or grandparents whose stories you would love to read. Not only to help fill you in on their history, but for the valuable life lessons learned? If any of these questions rings a bell, stop bugging yourself, or your "parental units"! Coach Ina has been working for years with folks of all ages who have never written in their lives, as well as previously published authors. She has a wealth of proven techniques that help both kinds of writers open up to new ways of thinking, and writing. She can help you get your book written, and printed, for friends and family, or the world. 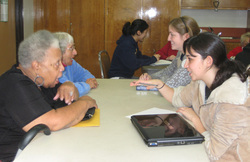 New Ina's Footprints Writing Workshop Series starting April 6 in west Los Angeles. Info and reservations here. Seats are limited. Check out details here to reserve your seat. And get an early bird discount! NOTE: Got a hankering to tackle, or develop a novel? Ina's tools and coaching services also help clients write livelier, richer, more intriguing fiction! Take your tale to the stage! We love to read our writing to an audience. You'll find videos featuring Ina and Footprints Club authors from around the globe reading excerpts from their writing. Everything from Andre van Zijl's tale that begins, "Africa grips me by the throat," to a delightful story about cookies, by Kaye Roberts, and another by David Brook, writing about life in Poland as the Holocaust began to creep closer and closer. These were recorded at a Spoken Word with Music book launch party for Stories From The Heart, vol. 2, an Amazon.com best seller. Below, a video from the show featuring musician Ira Westley, regarding a visit to a "strip joint." Use this video link to find our channel on YouTube to see Andre, Kaye, David and others reading their stories to a hushed room. Working with Coach Ina, or using her book, will help you jump right in! And keep you motivated! "It's easier than I thought it would be!" "Ina took me to a place I never would have gone on my own." "It's just plain fun! " Got a memoir writing question? Check out "Ask the Coach" -- you might find the answer, or write the coach yourself. 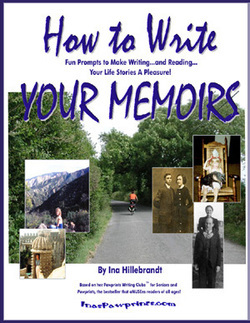 To find out more about how Coach Ina can help you write, shape and publish your memoirs, or fiction, click here. "The good thing about writing your memoirs is you can go back and see where you screwed up, and maybe forgive yourself."